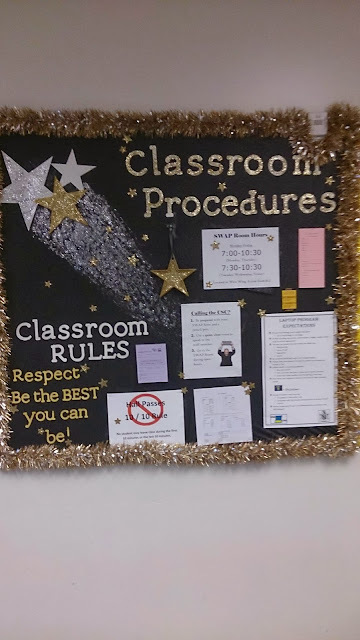 This board was actually designed by some of my students, but I LOVE it. I really liked the idea of using tinsel for the border. They even hand painted and then glittered little wooden stars. One of the students had a parent who worked at Boeing and they 3D printed a star "pass" for my classroom. I use this board as a place for all the rules/basic information that my students need. There are hours for the computer help room here, forms for computer trouble, passwords for school databases, a school-wide hall pass policy, passes for the library, schedules, etc. It's like command central for the classroom.